I can't believe Halloween is so close! We still haven't decided what our family will dress up as yet, but hopefully we can throw something cute together at the last minute. Making costumes is so much fun, and obviously I LOVE the candy aspect of it too. The other day I was reading my baseball friend, Nicole's blog. She's seriously super-mom, and I love reading about her adventures with her little boy and precious twin girls. Her little boy, Blake, has food allergies, so she was talking about how Halloween can be a tricky time for them. 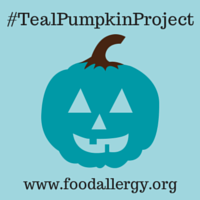 FARE (Food Allergy Research & Education) has been promoting a great thing they've started, called the Teal Pumpkin Project. The project is encouraging communities and neighborhoods to have non-food treats available for their trick-or-treaters, and I think it's amazing! 1 in 13 kids in the United States lives with a food allergy, so chances are high that your house will be visited by at least one, if not more. We are still settling into our house, but if we do manage to grab candy to pass out (which is one of my favorite things to do) then we will absolutely have a teal pumpkin outside our door as well!